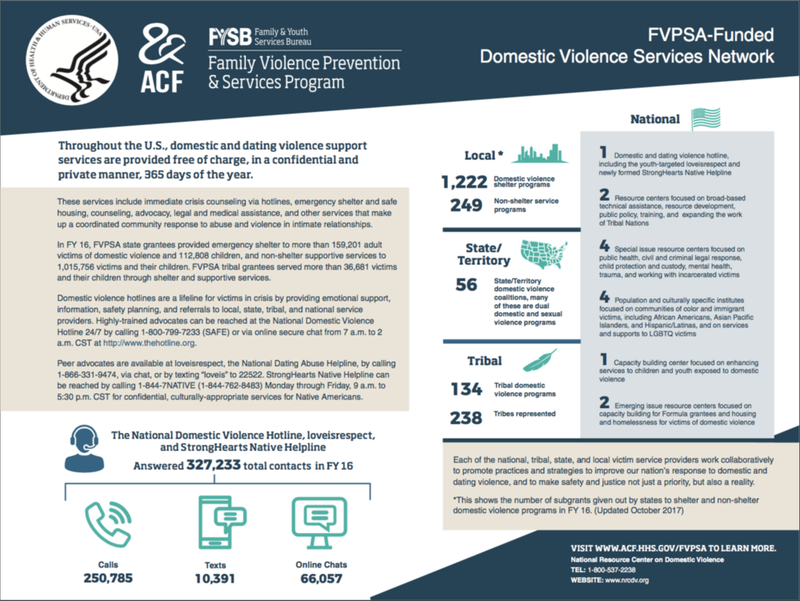 How has FVPSA helped strengthen the response to domestic violence in Tribal communities? FVPSA Grants to Native American Tribes (including Alaska Native Villages) and tribal organizations are formula grants funded through a 10% set aside in the FVPSA appropriation. The purpose of these grants is to assist Tribes in efforts to increase public awareness about, and primary and secondary prevention of, family violence, domestic violence, and dating violence, and to provide immediate shelter and supportive services for victims of family violence, domestic violence, or dating violence, and their dependents. Native Herstory: The Growth of the Movement to End Violence Against Women (9 p.), developed by NIWRC for Domestic Violence Awareness Month, tells the story of the strength of Native women over thousands of years and captures milestones in the Native women's movement. This resource on tribal domestic violence services presents graphical information on the number of tribes funded in states, total victims served by tribal grantees, race/ethnicity of clients served by tribal grantees, shelter provided by tribal grantees, total calls to tribal domestic violence programs, and education and prevention presentations for the year 2015. This resource on tribal domestic violence services presents graphical information on the number of tribes funded in states, total victims served by tribal grantees, race/ethnicity of clients served by tribal grantees, shelter provided by tribal grantees, total calls to tribal domestic violence programs, and education and prevention presentations for the year 2014. This resource on tribal domestic violence services presents graphical information on the number of tribes funded in states, total victims served by tribal grantees, race/ethnicity of clients served by tribal grantees, shelter provided by tribal grantees, total calls to tribal domestic violence programs, and education and prevention presentations for the year 2012. This resource on tribal domestic violence services presents graphical information on the total victims served by tribal grantees, total calls to tribal domestic violence programs, race/ethnicity of clients served by tribal grantees, shelter provided by tribal grantees, community outreach, education and prevention provided by tribal grantees, service contacts provided by tribal grantees, and clients served with batterer-intervention services for the year 2011. This interactive map represents Native American/Alaskan Native Tribes receiving Family Violence Prevention Services Act funds through Family and Youth Services at the Administration for Children and Families. The color-coded key located at the bottom of the map indicates amounts received by specific programs. The National Indigenous Women’s Resource Center, Inc. (NIWRC) is a Native nonprofit organization that was created specifically to serve as the National Indian Resource Center (NIRC) Addressing Domestic Violence and Safety for Indian Women. NIWRC seeks to enhance the capacity of American Indian and Alaska Native (Native) tribes, Native Hawaiians, and Tribal and Native Hawaiian organizations to respond to domestic violence. The StrongHearts Native Helpline is a culturally-appropriate, confidential service for Native Americans affected by domestic violence and dating violence. By dialing 1-844-7NATIVE (1-844-762-8483) Monday through Friday from 9:00 a.m. to 5:30 p.m. CST, callers can speak with an advocate with a strong understanding of American Indian and Alaska Native cultures as well as issues of tribal sovereignty and law that can provide immediate support; crisis intervention; personalized, practical safety planning; referrals to culturally-appropriate services; and education and information.